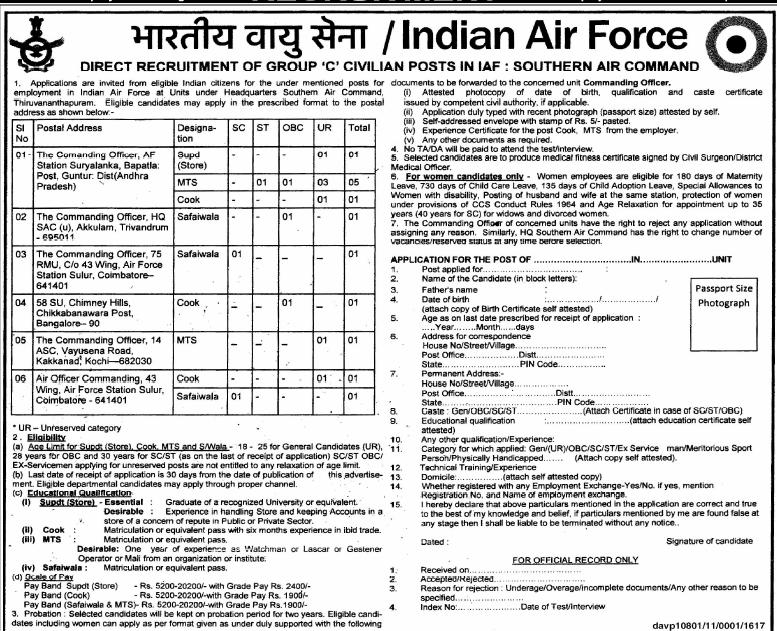 Group C civilian vacancy in Indian Air Force Southern Air Command. Application are invited for Indian candidates who are full fill given posts under the various Headquarters Southern Air Command , Thirunanthapuram. Age limit for Supdt. (Store), Cook MTS :- 18 to 25 years for General category candidates, 28 years for OBC, 30 Year for SCf/ST. Note :- No age relaxation for Ex-serviceman who are applying for unreserved vacancy. Supdt (Store) Minimum Graduate degree and experience in handling Store and keeping account in a store of concern of repute in public or private sector. Cook :- at least matriculation pass and minimum 6 month experience in ibid trade. MTS :- at least matriculation pass and one year experience as watchman or Lascar or Gestener operator or Mali from an organization or institute. what Documents to be required for Group C Recruitment Indian Air Force? Attested photo copy of qualification, cast, date of birth certificates. Self addressed evelop with stamp of Rs 5/- pasted.